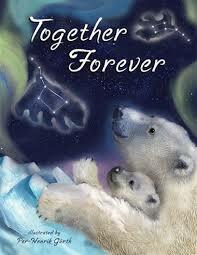 Together Forever is a story that takes place one snowy evening in the Arctic. Little Bear is tumbling about in the deep snow when he hears his mother calling to him. Mother Bear warns him not to wander too far away because she doesn’t want him to get lost. She sees that he is looking worried and explains, “If you ever get lost, stop and look up at the sky. There you will see the Great Bear and Little Bear stars. Watch the stars and wait for me to find you.” Mother bear smells a storm coming. Instead of following her home, Little Bear becomes distracted chasing the snowflakes. When the wind stops he realizes his mother is gone. Although he is afraid, he sits down and looks up at the sky. “Then he gasped! ‘Like me and Mama,’ Little Bear whispered as he traced the outline of the bears shimmering in the sky.” Within a few moments, Little Bear’s mother finds him and takes him home. Together Forever is beautifully illustrated with mixed media paintings. The Arctic landscape, the snowflakes, the aurora borealis and the constellations all evoke a vast sense of space. The bears’ expressive faces and the realistic details of their fur also add to the appeal of this book. Classroom Connections: The themes of love, family, polar bears, the Arctic and constellations all fit with curriculum for the early primary years. Having young students close their eyes to see if they can “picture” the bears as you give them an oral description of an illustration in the book would be a great way to lead into other visualization activities. This review is from Canadian Teacher Magazine’s May/June 2012 issue.